Our Emergency Personal Security Alarm Can Effectivity Protect Your Safety, It will be your another protector and loyal guardian ! Personal Alarm will be a great gift for your family members, Safety first. new personal alarm system is designed to be your safety companion 24 hours a day, no matter where you are. Loudly sound - Safety personal alarm with 130DB, sounds can draw people's attention even in a far distance. User Friendly - Sleek, smart and compact design makes it easy to carry, you can carry it anywhere. Easy Use - Pull the pin out to activate the alarm and insert it back to stop it. The sounds could last 40 minutes. Ideal Gift - This cute portable personal alarm is an ideal gift choice. it is a perfect choice as a self-defense weapon. Built-in LED light - Offer a bright LED light, activated by pushing a button and used for illuminating a dark area, find a keyhole or provide light. 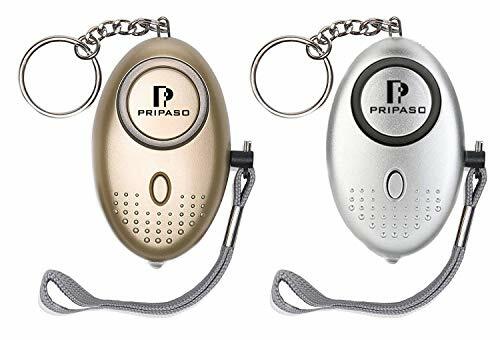 Portable Design - This self-defense keychain alarm keychain is small and portable, can be attached on backpack, belt loops, suitcases. Looks smart and fashionable. -The Personal alarm can be reused, Non-disposable product. -The alarm sound is very loud, please do not put by your ears. And don't give to baby to play. -This item is not completely waterproof, please not put it in the water and make it in a dry condition as possible.